A kayaker hits the waters at the 2014 BC Summer Games in Nanaimo. Kayaking is one of 18 sports at the Games. The countdown is on for the 2016 BC Summer Games in Abbotsford, and today January 23rd organizers are set to get the word out in a big way. Games officials have put together a community awareness event with the goal being to increase the awareness base of the event and attract volunteers. Event president Steve Carlton said the Games will take over two main local locations, and also have five smaller sites set up around Abbotsford. 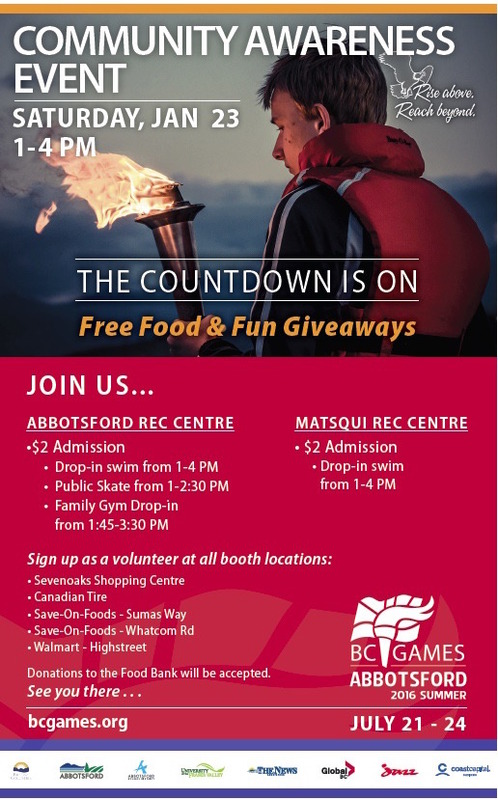 The Abbotsford Recreation Centre and Matsqui Recreation Centre are the primary sites for the community awareness event, with food, refreshments and prize giveaways from 1 to 4 p.m at both locations. Swims and skates will also be offered for $2 on that afternoon. Tents and information booths will also be set up at five other local locations today Jan. 23, with Games officials targeting popular stores and locations such as Sevenoaks Shopping Centre, Save-On Foods (Whatcom & Sumas), Walmart -Highstreet and Canadian Tire. Carlton said the volunteer base for the event is solid, but another 2,500 people are needed in advance of the Games. “We’re on track for volunteers and we’ve had a lot of people sign up but we’re waiting for the flood of volunteers to come, which we anticipate will come after our community awareness event and the torch lighting ceremony later this year,” he said. The community awareness event runs today Jan. 23 from 1 to 4 p.m. The next big event for the Games is the torchlighting ceremony, which occurs at the Matsqui Auditorium on April 13. Visit bcgames.org for more information on the event and for details on how to volunteer. The BC Summer Games runs from July 21 to 24, 2016 at various venues across Abbotsford and the Fraser Valley. Watch for updates at bcgames.org, here at www.abbynews.com, Intagram and Facebook.